The truth is out there and will arrive on Tuesday, July 24, when Apple will report its third fiscal quarter results. Naturally, that means from now until then analysts, journos and every nutter with a blog will be posting their best guestimates of how many iPads sold in the June quarter. 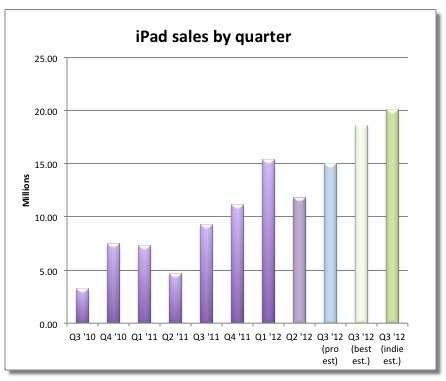 Apple reported 11.8 million iPads sold in the March quarter, up 151 percent over the same frame last year. Additionally, the company also said that for every Mac sold into education, schools and students purchased two iPads. So how many do you think Apple sold last quarter? Fortune has pulled together professional and independent estimates, and the numbers range widely. Assuming Apple ultimately announces 15 million iPads sold, that would represent about 63 percent year-over-year growth. For its part, Apple doesn’t offer unit volume projections. How many iPads sold is a lot? The headline 24 million guestimate comes from Asymco’s Horace Dediu, who gets lumped in with the indies where the consensus estimate is 19.88 million, nearly 5 million more than the investment professionals’ consensus number. However, Fortune’s average of the six independent analysts with the best track record comes in at 18.6 million, which would be 101 percent growth over the same quarter last year. Is that out of the question?